PLEASE NOTE: This toy comes in a see-through acrylic style as shown in the image. It is also available in an opaque style. Please select which style you prefer at the Options List. 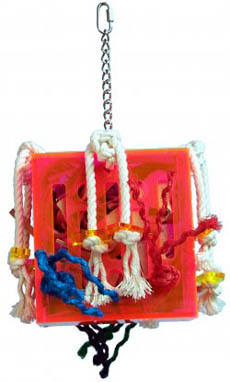 Chewable, interactive toys are necessary for a bird's well-being. This creative line of high quality toys offer play activity to keep your bird busy and entertained in a cage or on a playstand. Zoo-Max toys offer your bird a wonderful selection of toys that provide stimulation and a welcome change.